iPad Air: Shut up and take my money! Yes, I know. We’re all a bit disappointed with the “New New New iPad”, a.k.a. iPad Air. And remember what Apple pulled off when they discovered that they had a game-changing new component, the Retina display, but the overall hardware wasn’t up to the level yet – they sold it as the iPad 3, only to be replaced with the iPad 4 less than a year later. No, I’m not bitter with Apple over that. Well yes, I am, but the problem with my iPad 3 is that processing power has become an issue when using it for making music – an important use case for me. Waldorf’s Nave is a dream of a soft synth, but it’s pushing my iPad to the limit – run Nave, and you won’t be able to run much else. So processing power is increasingly becoming the driving force in deciding on what to buy and when. The least thing that you could say about the iPad Air is that it’s going to drive down the prices for iPad 4’s. But considered that the Air is sporting a variant of the last-generation Apple A7 processor, you can expect it to have about double the processing power of an iPad 4, or about six times the performance of the iPad 3. That’s presumably worth a hundred Euros extra. The iPad 3 shipped with an inferior processor incapable of keeping up with the huge retina display, and suffered a life-time of sluggish performance and annoying bugs. Developers consistently tell me that the majority of their bug reports come from iPad 3 users. Now there you go. Unfortunately, this means that my carefully hand-modded IO Dock becomes obsolete – the iPad Air, due to its smaller bezel and different overall dimensions, just won’t fit, and there’s the issue of the Lightning connector which the IO Dock doesn’t have – although there are reports that an adapter would work, this would mean additional tinkering, soldering, dremeling. With hardly any chance of producing satisfactory results. So what I’ll probably do is build a USB setup from scratch, with a modded Lightning-to-USB-adapter capable of charging the iPad; maybe with a powered hub, and a multi-channel interface like the Akai EIE. (Good list of class-compatible, iPad-friendly devices here.) It’s far from perfect, and maybe sometime I’ll integrate it into my own Dock. Once again, terra incognita. 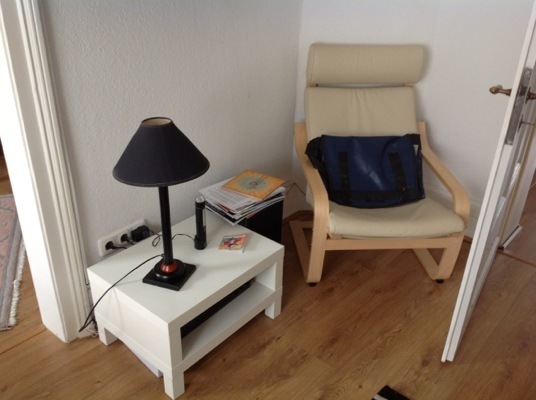 Dann kam so nach und nach noch ein wenig was dazu: ein Hardware-Synthesizer, das IO Dock und ein IKEA-“Lack-Rack”-Style-Schränkchen für den HiFi-Receiver. Und ich sah, dass es gut war. An sich freue ich mich ja immer noch diebisch über die Animoog-App auf meinem iPad, trotz kleinere und größerer Zipperlein bei Bedienung und Systemintegration. Getrübt wurde diese Freude allerdings vom letzten Update auf V1.1.0: das führte nämlich auch bei mir dazu, dass gar nichts mehr ging – die App stürzte gleich wieder ab. Etwas Rumexperimentieren hat die Lösung gebracht: einfach löschen und nochmal neu installieren. Nachtrag: Manchmal hilft es, erst die FAQ zu lesen – auch wegen der Warnung: Vor dem Löschen alle Sounds zu iTunes speichern, sonst sind sie weg! Aaaah, the iPad! Loads of screen real estate to convey intuitive information, smart touch interfaces to provide groundbreaking usability, and enough processing power to emulate almost any synthesizer you ever dreamt of. For pennies. If only the programmers were up to a simple task: implementing a standard that has been around for 30 years. I’m writing this post in the feeble hope that it’s my knowledge that needs to be updated rather than nearly all of the iOS music software I’m using, but I fear it’s really that simple: Suppliers of state-of-the-art virtual synthesizers for the iPad are, in general, incapable of a few simple things. Like enabling their instruments to change preset on a base MIDI command. 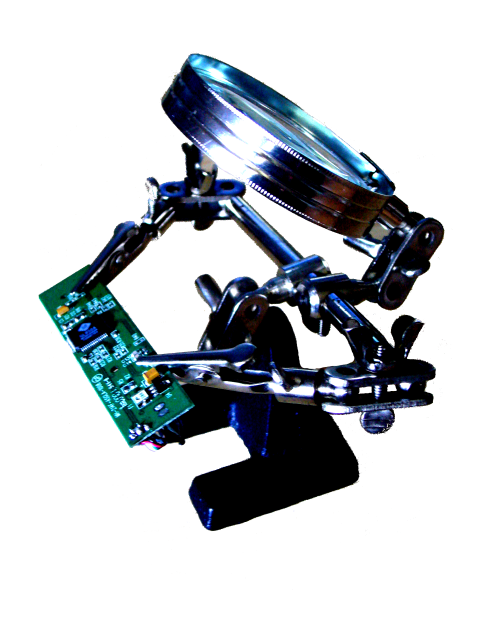 Or respond to the most standard controllers, the modulation and pitch wheel and the sustain pedal, by default. In the 30 years that MIDI has been around, obviously no one taught them that MIDI commands are paired with a bus ID, a “Channel”, and that there are 16 around so that it’s possibly not a good idea to have every instrument listen to Channel 1. The idea of multitimbrality – one synth engine responding to different channels doing different sounds – seems way too advanced for most of them. Poor lot. But not as poor, ill-informed and illiterate as the guys writing the manuals. Anyway, here’s what I’m using, and I’m proud to say that all of my music equipment can be hauled around in a backpack, including the amp box. Not like in the olden days when playing keyboards made you strong because it was quite a lot of really, really heavy gear you had to move. Actually the only no-brainer on this list. 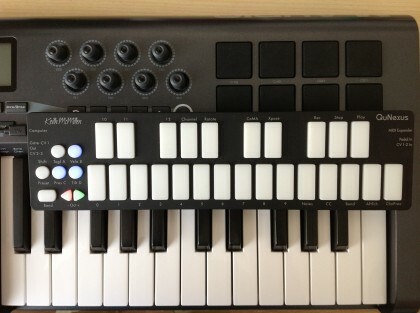 Connected to the iPad Camera Connection Kit, it just works – as would any other class-compliant USB-to-MIDI interface. 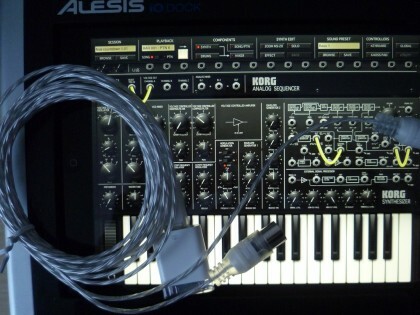 This one’s cheap and has the additional benefit that you can plug the MIDI connectors into MIDI IN or MIDI OUT – the interface figures it out for itself. Not an app but actual hardware. Simple, lightweight, versatile. 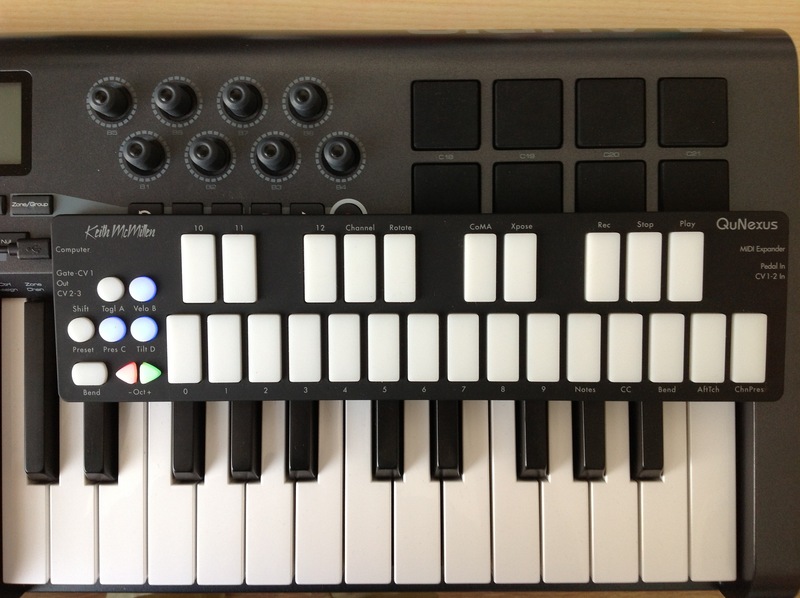 A decent 2-octave keyboard comes with a bunch of pads, controls and trigger pads that can be programmed to send almost any MIDI command. 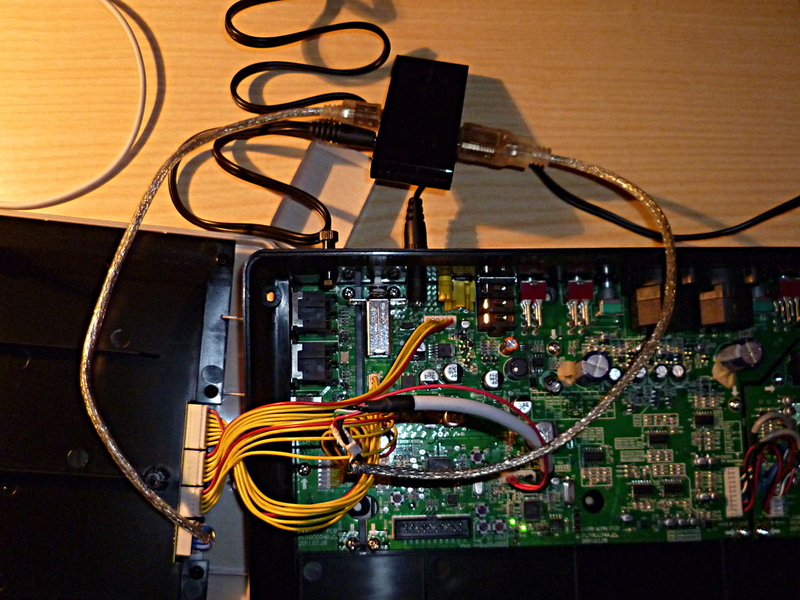 Hardware’s fine, software’s dodgy, as far as usability is concerned. But what I really admire the Axiom for is it’s manual. I think that you couldn’t make the simple task of programming a controller any more incomprehensible if you tried. It almost makes the thing unusable – until you’ve found out for yourself how it works. Which takes some resolution not to consult the manual – which you have to, if only for the MIDI charts. I bought this app when it was still 99 cent rather than the regular 24 €, which is a bit over the top if you ask me. 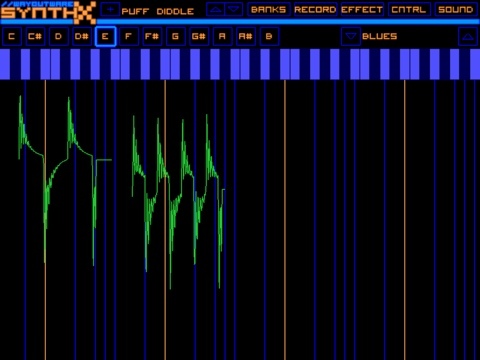 Still: A brilliant softsynth, great sounds, and an ingenious user interface. Loads of fun. Kinda makes you hope that it would receive notes on any other channel than 1, doesn’t it? Not that the CoreMIDI implementation is any fun to play with – any time you plug/unplug the MIDI port you have to reload the configuration. Couldn’t get it to run in the background either. No MIDI implementation chart in the manual (and I’m using that term in the most liberal fashion here). Did I mention it does only work on Channel 1? Cheap it isn’t, as apps go: € 26 for one music app? 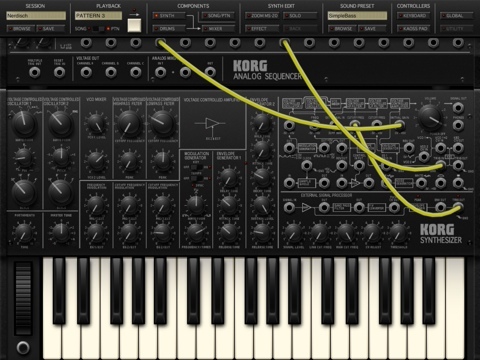 Well, this app is worth it – considering that it’s a true reproduction of an 80s vintage production system, the MS-20. 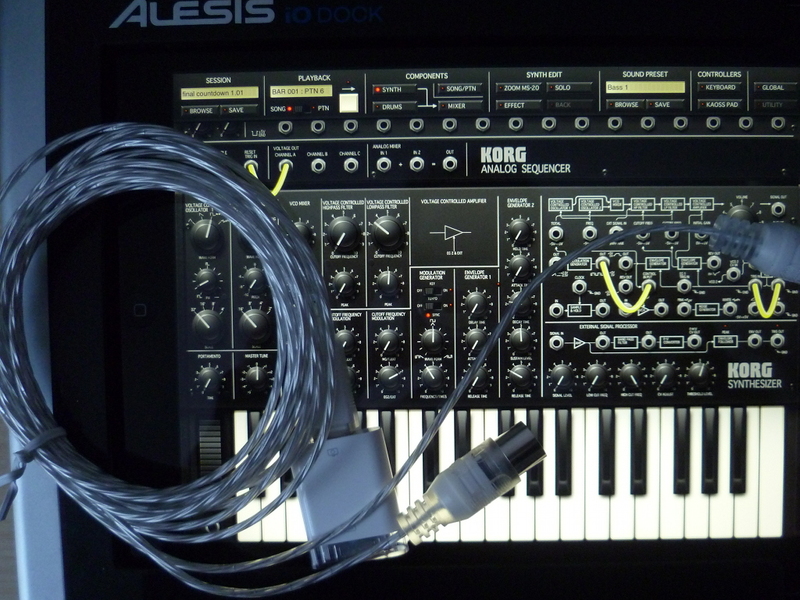 They say that the MS-20’s filters did not resonate as much as distort, and judging from the iMS-20 app, it’s so true. Analog basses and drums delivering incredible punch – and it looks great, too. It’s even multitimbral. Sort of. Seven voices can be produced at once, each of them can sport a different sound and is controlled by a different MIDI channel. Now guess by which ones. Channels 1-7 are hard-wired. So is a limitation of the original: No changing sounds on Voices 2-7 while a song is running. This even makes sort of sense – those voices are supposed to be the drum section, and obviously, you wouldn’t expect anyone to change drum voices, would you? Voice no. 1 is for expressive bass, even for solo. 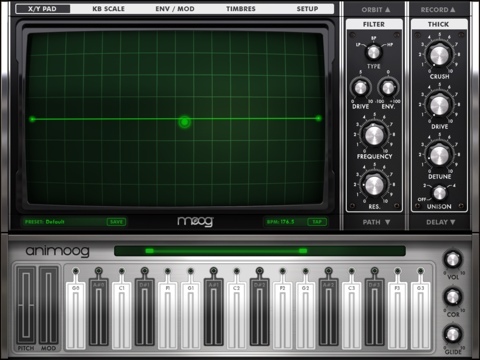 Now: wouldn’t it be nice to use this lovable monster to trigger loops while playing along, or even running a sequencer? Sorry: It does not run in the background. It does not understand Program Change commands. Or standard start-stop commands for the pattern sequencer. 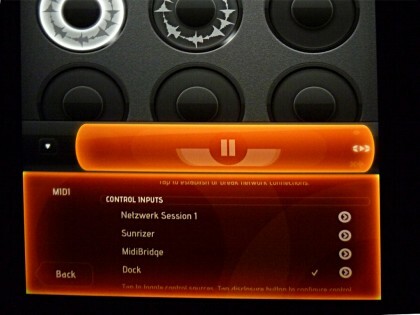 And you can’t actually trigger the loop “pads” via MIDI – according to the painstakingly detailed MIDI controller map, you can’t. Unless you own some special hardware that used to control MS-20 soft synths via some kind of “native mode” that kept Korg from bothering to implement this functionality in MIDI. The SynthX is that little, skinny guy in your class that constantly tried to make everybody laugh. It’s a brilliant idea: Take a “vintage” (read: outdated) one-oscillator-per-voice ARP monosynth as a model, make it polyphonic and make it use effects, and give it a unique, fretboard-like, touch user interface. Which keeps you entertained for about 15 minutes – no, you’ve guessed wrong, it’s not stuck on Channel 1, it does not understand MIDI at all, as far as I can see. The poor thing even refuses to load on my iPad HD most of the time any other music app is running in the background. Which kind of sabotages the humble plan of playing it as a solo/pad voice over a background drum track. This is why I won’t dwell on the fact that in my humble opinion, the usability concept is stuck half the way: No using the iPad’s motion sensors as a modulation source – or midi controllers, by the way. Sounds would have been so much less boring. 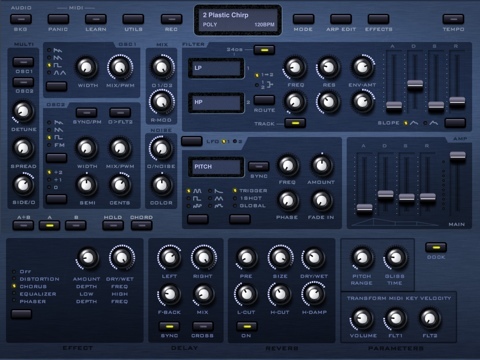 This one’s actually great – and though the guy who made this app seems to have had a rather sketchy knowledge of MIDI controllers, he is willing to learn – and is constantly updating his soft synth machine: It knows how to deal with a sustain pedal now. It has learned to understand Program Change commands. Well, Program Change, not Bank Change, which is a hassle because you can’t reorder preset banks, but no nitpicking now. 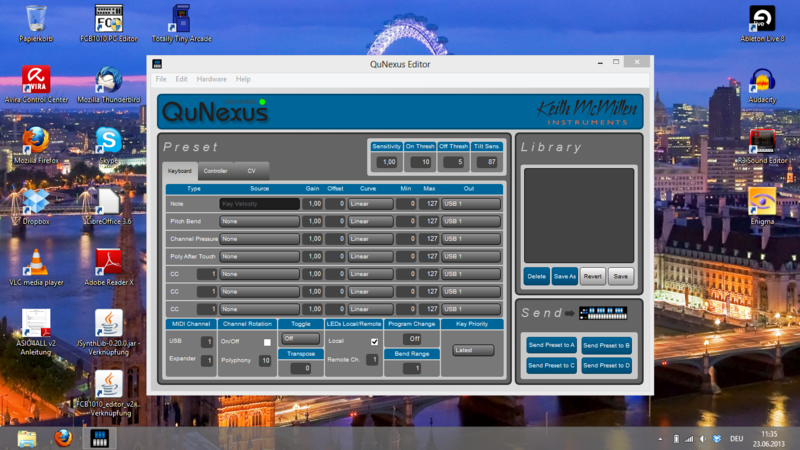 It has a MIDI learn mode to route any controller to any control, and it runs spotlessly in the background of software like the Genome sequencer app. All the parameters are on one page. 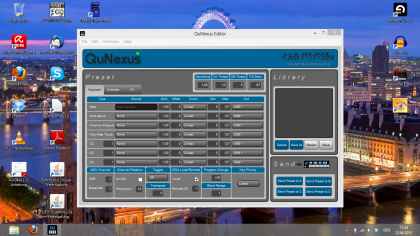 You can even switch off the faux keyboard and use valuable screen estate for the effects section controls. 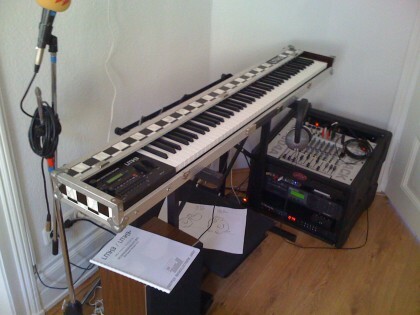 I used to play a borrowed Polysix for a couple of months, a rather simple and cheap machine as synths went, even at that time, but with the instant fun of turning knobs and achieving great sounds – just because it was simple. The Sunrizer app gives me exactly that sort of fun – but is so much more powerful. Combine stacked sawtooth waves with a traditional lowpass filter and manipulate depth and resonance of a formant filter in row, and you can cross over from rich, warm pads to Zombie-like solo voices in an instant. And, believe it or not: it’s not even stuck on MIDI channel 1. There are so many more missed opportunities. Modrum is nice and lean -but no preset change via MIDI. NLog Pro, a soft synth from a guy in my home town Frankfurt, is a proper professional instrument – unfortunately it was programmed for looks rather than usability. What’s the point of having gorgeous little knob dial panel graphics if you have to switch (!) between six (!!) of them to control your sound? It’s an iPad, for Christ’s sake, learn how to use it! And don’t let me even get started on Garage Band and MIDI. So the iPad is not really your ultimate music machine yet, although you can almost see how the software is becoming more and more mature – having a decent sequencer/drum/synth combination up and running is possible now, after all. This is the good news, and it almost makes you forget the bad news: Never forget that in terms of processing power, an iPad is a rather weak piece of equipment. 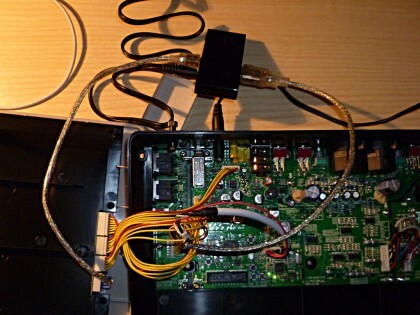 Any old Celeron laptop packs more power – so you are bound to run into some limitations at some point.